This aquarium has an artificial lake of approximately 170.000m3 of salty water and a 144 metre tunnel that crosses it underneath from where we’ll be able to contemplate the sea life of the aquarium, like eagle rays, lobsters, moon fish, octopuses and small sharks. The aquarium also has a 15.000m3 dolphinarium and several water attractions. It’s a perfect place for the whole family and enjoy all the sea animals that live in the Puerto Banus aquarium. This is another one of those recommended places for the whole family and enjoy the wildlife. 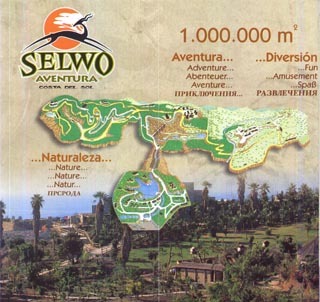 Selwo does not allow the entrance of food but you can use one of the restaurants there. One can reach Selwo either by car or by bus, it also has a large parking lot for only 3€ and a hotel for those who want to extend their stay in an accommodation emulating an African reserve. 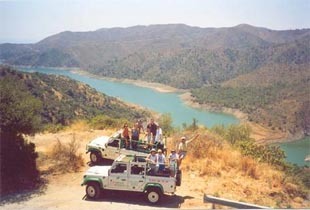 This attraction offers guided trekking excursions and in 4x4 vehicles around the Sierra de las Nieves Natural Park and the Ronda mountain range. It’s a recommended activity for the whole family or with friends where you’ll be able to enjoy the ecotourism and an outdoor experience. A place where you can celebrate events and where they hold a street market every weekend. Funny Beach has an amusement park, mini-karts, a nautical area and a beach club. It’s an ideal place for the whole family although maybe not for all pockets, the price of the mini-karts is rather dear (20€ for 8 minutes), and the jet skis cost 50€ for 15 minutes for one or two people; it has other attractions like a Zodiac ride (150€ for 1 hour), F1 simulator, pedalos (20€ for 1 hour)...and many more. In the Guadalmina and San Pedro de Alcantara natural lake, 5 minutes away from Puerto Banus, we’ll find this attraction known as “Cable Ski Marbella”, where the instructors help out both experts and beginners of water-skiing or wakeboarding while they’re dragged along by a system of cables all around the lake. If you fall you only have to wait for the next cable...it’s as easy as it is fun, and at a good price. The price of this attraction is 11€ for 4 laps and 21€ for 10 laps, and it’s open from mid March till mid November, from 11am to 2pm, although the opening hours may vary. This place is also recommended to celebrate birthday parties, a perfect spot to spend a day with the whole family and do a bit of exercise. We hope you enjoy your holidays in Marbella, most of the tourists come back after their first visit. Give it a try and come to the Costa del Sol!